Art Deco is a style that emerged in 1925, a result of exhibits at the World's Fair held in Paris, France. The term Art Deco is a shortened form of the event's name: Exposition Internationale des Arts Décoratifs et Industriels Modernes (International Exposition of Modern Industrial and Decorative Arts). Certain design elements are consistent throughout period pieces, making it easy to identify cars, fashions, and even buildings. Authentic jewelry from this period was made between 1920 and 1935 and has at least one, sometimes all, of the following traits listed below. The jewelry styles remained popular through the late 1930s and have since reemerged as one of the most popular antique jewelry styles. Be wary of jewelry with the description "Art Deco style." If there is no indication that this item was specifically made in the early 20th century, you are likely looking at a reproduction. Most jewelry made in the Art Deco era was fashioned in either white gold or platinum. 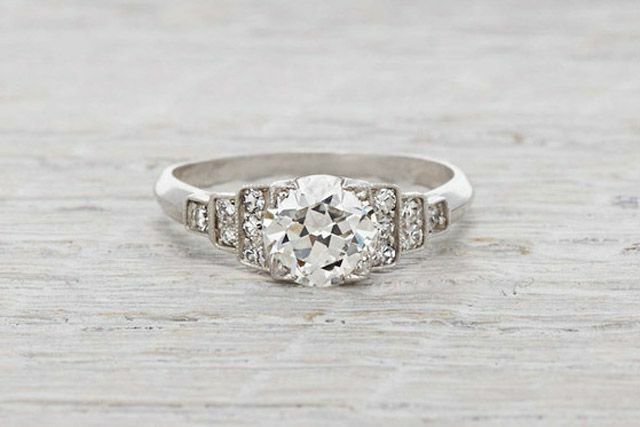 White gold made its first introduction to the public during the Art Deco era around 1915 when it was invented to combat rising platinum costs and rising demand for a light colored metal. Yellow gold was very much out of style. Other common diamond cuts for Art Deco era jewelry include antique cushion cut, transitional cut, and Asscher cut. Art Deco jewelry precedes the Edwardian Era. For jewelry novices, it can be difficult to tell the difference between the two eras since both incorporate platinum and antique diamonds. However, Art Deco design differs from Edwardian design in that it is more geometric and symmetrical. Where the Edwardian turn of the century jewelry was very nature inspired, light, and flowy, Art Deco design incorporates more geometric shapes, less free space, and a more industrial feel. Calibre cut stones are such an important part of Art Deco jewelry design. Calibre cut stones are custom gemstones that are cut specifically to fit into jewelry design. They are tightly spaced together against other stones or metal and have quite the impact on the overall design. Filigree work is defined by small intricate cut-outs and was never done quite so well as it was during the Art Deco era. Filigree in jewelry was perfected in the late 1920s through the use of die-cast machines, and it was readily available by the early 1930s. These designs incorporate a lot of synthetic stones as well as diamonds, platinum, and white gold. It is nearly impossible to replicate the crisp, refined filigree work from the 1920's today because most rings are made through the use of wax molds. These reproductions have a softer, more goopy look to them as opposed to the stark, stamped edges of authentic filigree work. Another sign you are dealing with a reproduction? Most filigree jewelry from the Art Deco era was made with either 10k or 18k white gold. If your jewelry is 14k white gold and has a yellowish tint to it, chances are it is a more modern reproduction. The yellowish tint is because different alloys are used today, differing from those used in the 1920s, making the older gold more grey in its natural state.